“Like time and space and yadda yadda yadda. Dig around a little. Get some earth under your fingernails. Take advantage of the open spaces. Analyze my nonconscious input, where my decisions are made. Before I can think about them. Before I can overthink about any of them. I spoke with Naughton about her favorites, her goals, and what happiness means for her. My favorite food to make right now is carnitas. I've experimented making them on the stovetop and in a slow cooker. I think I prefer the stovetop method because it means fewer dishes to clean up. I just got a pressure cooker from my friend, Alison, and I've been using that to make soups and stews. Another notable first: I made spicy chicken wings over the weekend, for the Super Bowl. The Pepper Plant chunky garlic variety, and this one habanero hot sauce with a picture of a donkey breathing fire on the label) with the melted butter. It's been cold and rainy so I've been thinking a lot about the spicy beef soup with pickled mustard green at Chong Qing Xiao Mian. I'm gonna try to run out there on a late lunch break today. I think about food a lot. I can eat a lot. I am usually hungry. Lately, I've been listening to Aquarius by Tinashe on my commute to and from work. At the gym, I invariably listen to either Nicki Minaj's 2007 mixtape Beam Me Up Scotty or her first album Pink Friday. I had "Dancing Queen" by ABBA stuck in my head the other day so I played a bunch of ABBA and Ace of Base music videos on YouTube. Right now I am at work and I am listening to the soundtrack from the HBO show The Sopranos. This is a really difficult question to answer. Should I list three books that I read as a child that have stuck with me? How about, here are three books I read as a child whose titles I do not know but certain elements of the plots of each have stuck with me for whatever reason. There is this one children's book about the Phantom of the Opera chronicling the Phantom's life from his childhood when he was in a traveling sideshow for being weird-looking and having yellow eyes, and then goes into the classic story haunting the opera house. I liked the descriptions of the underground tunnels and still think about it a lot. There's this other book about a girl whose parents get divorced and her dad moves into an apartment complex and she spends alternating weekends with him there but he isn't around a lot so she becomes friends with a girl her age who lives in the apartment complex and they spend Friday nights together taking turns washing their hair in the sink and then getting under the bubbles of a bubble bath. There's another book I think about a lot which is similar to The Contender but is not The Contender and I might just be conflating them because I read them both in the 7th or 8th grade, but it's about a kid who comes from the islands to live in Harlem or some other part of New York City and he makes friends with a boy in his class and a girl who wears starched white jeans who takes the same bus as he does but there's another kid who bullies him at school and he reacts to this by stabbing him in the gut in the hallway one day and it feels "like a soft plum" and he jumps over the turnstile in the subway and then has a bunch of flashbacks about living on the island and sneaking off with his friends to drink rum. 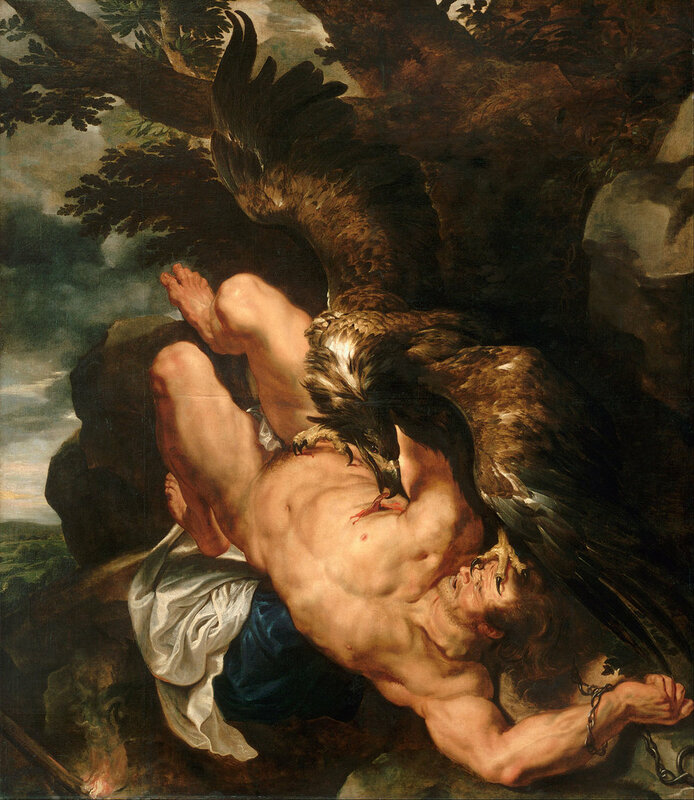 I have always loved this painting, Prometheus Bound by Peter Paul Rubens. I mean, it's now, right? I'm not trying to be dramatic. It's gonna be slow, and it's going to cause anxiety and pain for everyone involved to varying degrees but we're not going to do anything about it. At least not on a grand scale. I hope that isn't the case, but I don't think it will take anything less than an actual revolution to correct our gradual but accelerating decline and demise. I think about that scene in Deep Impact where Tea Leoni and her character's dad are standing on a beach watching a supersonic wave, which will kill them instantly, slowly approach before it engulfs them. I think about that scene a lot. Clueless, The Birds, and Die Hard. My favorite animal is Sookie, my cat and best pal. I love her so much. I love all cats but Sookie is my favorite because she has a lovable personality and just likes to hang out all the time. She also follows me everywhere when I'm at home, which can be awkward but it's also endearing. Why does she need to come into the bathroom with me, I don't know, but when she scratches at the door I let her in. I'm also fond of the animals in my backyard. There's a possum, a family of skunks, and a family of raccoons. I see them at different times when I'm sitting on my porch at night and I like knowing they're out there. My notebook, even though I haven't written in it recently. I always have it, just in case I feel compelled to write an idea out. I'm afraid of heights. But I like roller coasters. I'm afraid of being yelled at. Drinking coffee, smoking spliffs, sitting on my porch at night and thinking about the possum and the skunks and the raccoons. Doing things that I say I'll do. Finish some things. Got some new books I'm publishing on Be About It Press, one by Cassandra Dallett, one by Nooks Krannie. I'm trying to finish writing this novel I've been visualizing since 2015 which began as a self help book but has since grown into something bigger. I have other projects that I've started or are near completion but abandoned and I'd like to finish them, if only to make room for something new. Alexandra Naughton is a writer based in Richmond, California. She is the founder and editor-in-chief of Be About It Press, established in 2010. She is the author of six poetry collections including You Could Never Objectify Me More Than I've Already Objectified Myself (Punk Hostage Press, 2015), I Will Always Be In Love (Paper Press, 2015), and I Wish You Never Emailed Me (Ghost City Press, 2016). Her first novel, American Mary, was published by Civil Coping Mechanisms in 2016.